11/10/2017–CHERRY POINT, NC–On 3 October 2017, Cadet Maggie Thibodeaux received the Billy Mitchell award and was promoted to C/2d Lt. This award marks the transition from cadet NCO to officer. The General Billy Mitchell award is one of Civil Air Patrol’s most prestigious cadet honors. In existence since 1964, it marks a coming of age for CAP cadets as they graduate from the cadet enlisted ranks and prepare for even greater leadership as cadet officers. After the promotion ceremony concluded, a cadet Change of Command Ceremony was held. C/Capt Blaise Thibodeaux stepped down from his position as Cadet Commander of the Cunningham Field Composite Squadron and C/2d Lt Maggie Thibodeaux stepped up to fill that position. This ceremony is a formal change of command from one cadet to another and the passing of responsibilities and leadership. In the ceremony, the Outgoing Cadet Commander passes a flag to the First Sergeant, who in turn passes it to the Squadron Commander. The Outgoing Cadet Commander receives the final salute from the squadron. Afterwards, the Squadron Commander passes the flag back the First Sergeant who then passes it to the Incoming Cadet Commander. After passing it back to the Squadron Commander, the Incoming Cadet Commander receives the first salute. The passing of the flag symbolizes the passing of the responsibilities of Cadet Commander. 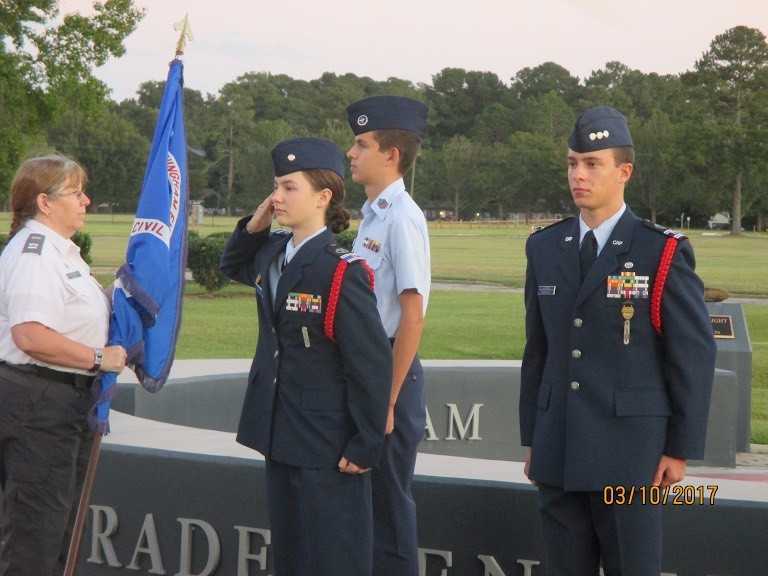 C/2d Lt Maggie Thibodeaux has been in the Civil Air Patrol cadet program for two years. She has served as the Cunningham Field Composite Squadron Flight Sergeant, First Sergeant, and is currently serving as Cadet Commander. C/2d Lt Thibodeaux has attended multiple NC Wing events, including staffing Summer Encampment, attending Drill and Ceremonies Academy, and Cadet Competition. She has also earned the Daughters of the American Revolution Outstanding Cadet Award and NRA Marksmanship qualification. Cadet Commander is the highest cadet position attainable in a squadron. The Cadet Commander is ultimately responsible for the welfare and actions of his/her squadron, and the position therefore requires hard work and perseverance. It is a significant leap of responsibility and challenges the best of leaders. The Cadet Commander must adhere to the CAP core values, mentor subordinate cadets and organize squadron activities.